Skydiving NYC: Make a Tandem Skydive! Skydive Cross Keys is located 100 miles south of New York City and is one of the closest skydiving centers to NYC. It takes roughly two hours to drive to our location from the city center. If you are visiting NYC area and don't have your own transportation, you will need to rent a car to get to us (or to any skydiving operation near NYC for that matter). Unfortunately it is difficult to get to any skydiving centers by public transport. If you have a large group however, you may want to look into renting a bus to split the cost. Looking for a hotel? We have a special rate of $89 at Hampton Inn Turnersville, only 5 min away. 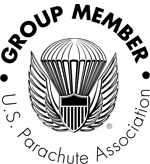 Mention group code 000 276 4179, or "Freefall Adventures". Another local option is Best Western Monroe in Williamstown. Here are the step by step directions from New York, NY to our skydiving center. We are known for the quality of our video/photo packages.